Home Healthy Feet Lumps and Bumps? I always say that footwear can either make or break the comfort for your feet, and here's two great examples of either simply adjusting your footwear, or how wearing a different type of shoe can make a big difference. I recently had the pleasure of attending a three day residential business developement course, with the opportunity to network with loads of local business owners, some just starting out and some looking to expand after many years of trading. It was time very well spent, and highly recommended. Enterprise Made Simple were fantastic, and I'd highly recommend them. I was chatting with one person over lunch, who mentioned his foot problems of shooting pains, and discomfort wearing certain shoes. He advised of some 'lumps' on his feet, which cause pressure pain. Bingo! A great opportunity to help someone, and demonstrate podiatrists don't just cut nails! After looking at his feet, and seeing the 'lump' on his foot (both feet), a quick feel suggested it may be a bony growth at the top of the 1st long bone in the foot (1st metatarsal), or possibly a raised bone in the mid-foot (medial cuneiform). When he placed his foot back in his shoe without his sock on, I could see where this 'lump' was sitting. So an easy way to help with the pressure was to re-lace his shoes, missing out the 'eye's' on the level around the 'lump'. 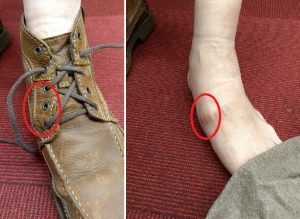 After re-lacing his shoes, he had a walk around, and said he could feel a big difference! I suggested he selects footwear made from soft materials, which will easily stretch around his bony 'lump' and reduce the pressure on his feet. What about the 'Pump Bump'? The 'Pump Bump', also correctly known as Haglunds Deformity, is a bony growth which occurs on the back of the heel. It gets the name of the 'pump bump', as it normally gets sore from wearing running shoes, as the back of the shoes are normally quite low and rub against it. They can also become painful if wearing a shoe made from stiffer material such as leather. Wearing accommodating footwear will help. Removing the pressure from the back of the foot will make a huge difference. 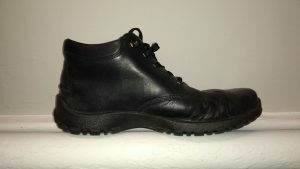 I'd recommend either a boot made from soft leather for a male, which will shape around the lump, or some form of sandal, or strappy back shoe for a female. Surgery can be done to reduce the haglunds deformity, but this is usually the solution when other methods have failed. Fit the shoe round the foot, not shape the foot to fit the shoe! What should you do if you have foot problems? 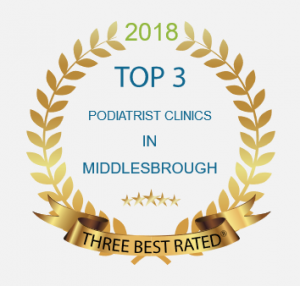 If you are having problems with your feet, why not give me a call and book an appointment for one of my clinics at either Middlesbrough or Helmsley. <--click to call!